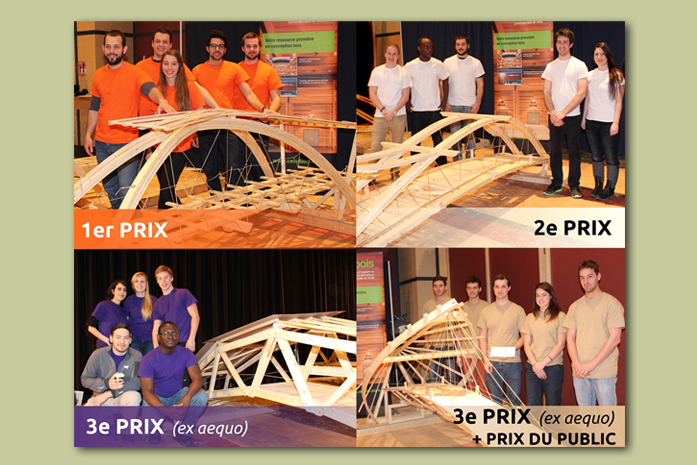 Quebec student engineering challenge highlights the beauty of wood construction. As a construction material, wood has a lot going for it. It’s durable, structurally strong, and it’s fast and efficient to build with. There’s also its value as a renewable building material, but most of all, it’s just beautiful (yes, we’re a little biased on that front). And beauty built in wood is what the judges saw earlier this month at Laval University as they scrutinized the entries of the 6th annual Cecobois Challenge, a student competition designed to create a hands-on experience for engineering teams to learn about the practical possibilities, versatility and benefits of wood construction. This year the challenge was to build a model on a 1:10 scale of a bridge for pedestrians and cyclists. The design of the wooden structure had to be innovative and structurally sound. The competition, organized by Cecobois, the centre for expertise on commercial construction in wood, hosted about fifty architecture and engineering students from Québec City, Sherbrooke, Montréal and Chicoutimi. The jury scored projects based on how well the design was adapted to the use of wood as the building material. They considered the architectural concept as well as transfer loads and the durability of the structure. In the end, four teams were selected for top honours.